Why does a shop bought wedding dress cost what it does? Weddings are expensive but every penny in the price of a wedding dress ticket price is going to a person or to a service needed to bring the dress to you. As with any area of life a discounted price will bring you a discounted level of quality and service. 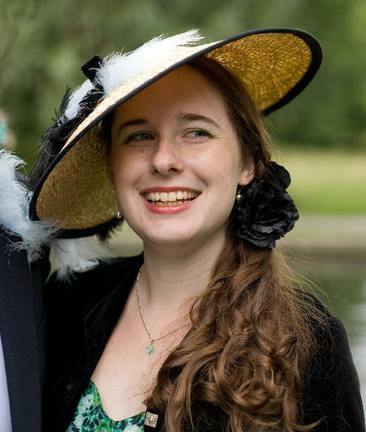 Though I now work in bespoke bridal-wear I started out with a small shop in Reigate as their alteration seamstress, while still at university. After a few years the opportunity came up for me to buy the business so I got to see their accounts in detail. As circumstances panned out I opted to buy a house instead of the business, and never looked back with the bespoke work I now love, but it did give me an insight into how small retail profits work in this industry. 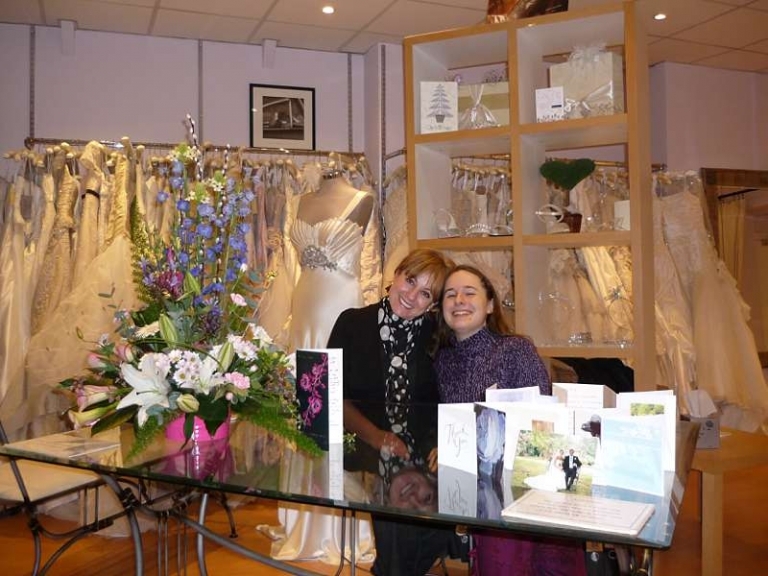 Me and my boss, Liz, on my last day as her alteration seamstress at her Reigate bridal shop in 2008. She was like an Auntie to me, so kind and encouraging and truly helped launch the career I have today. Here is an example of where the money paid for a mid range designer dress might end up along the chain of supply. =£575 net profit to shop. Plus there was the cost of the £625 sample dress from the designer so you could choose your dress. Sample dresses are usually sold later, for about half the full price, so £750 in this case. Less £150 VAT, =£125 loss. And aS many sample dresses get sold off this way without ever selling a ‘repeat’, that is never selling a new one to a bride the shop makes almost nothing on these though selling them off is better than having them clog up the rails! All in the all the actual cost of labour and materials in a £1500 dress is probably about £150 or less. The rest going towards the genuine costs of all the people and services involved in bringing the dress to the high-street for you to find and buy. The person who sewed your dress probably worked for around £1.50-£3 an hour. This is an unpleasant reality but a normal skilled workers rate in many garment mass-manufacturing areas. When I used to work for a wedding dress shop in Reigate, Surrey I used to feel very sad whenever anyone asked my boss for a discount, or tried to play off the price of a particular dress from one shop to another. After all the costs above the owner used to take home a salary for herself of about £300 a month. Bridal wear is not the money spinner many people think it will be! As with any area of life a discounted price will bring you a discounted level of quality and service. My old boss and most wedding dress shop owners go into the business with a passion and a love for the dresses and the happy clients they meet. They are willing to bend over backwards to argue for the rush order dress, work long evenings so brides can have after-work dress fittings and fastidiously steam each dress or veil (it takes hours) for your perfect crease free day. Asking them to further fund your wedding by discounting their take home pay is not the best way to encourage good service. If I can persuade brides to appreciate their passion and work I can promise they will be passionate about your wedding day too!